Brazilian President Dilma Rousseff said US President Barack Obama had agreed to respond formally to the spying allegations by next Wednesday. “My trip to Washington depends on the political conditions to be created by President Obama,” said President Rousseff. 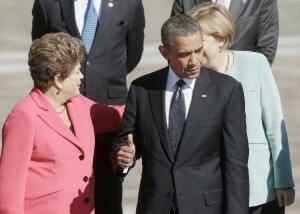 Rousseff and Obama had met on the sidelines of the G20 Summit in Saint Petersburg. Brazil and US ties have come under increasing strain as the Brazilian Senate formed an Investigative Parliamentary Commission last week to probe reports that the US National Security Agency (NSA) spied on the Brazilian leader. “We intend to protect national sovereignty,” said Senator Vanessa Graziotin, of the Communist Party of Brazil (CPB). The committee comprises of 11 main members and seven substitutes. The commission has been tasked with probing claims the NSA monitored emails and intercepted phone calls between Rousseff and several of her top aides within an initial timeline of 180 days. Obama promised to give the Brazilian government an answer by next Wednesday to its request for an explanation to the spying report, Rousseff said before leaving Russia. Rousseff is due to make a formal state visit to Washington on October 23.